It appears no corner of the planet is safe from wildfires. Queensland, Australia is dealing with a bizarre spate of bush fires in what’s normally the wet season, a setup that’s eerily reminiscent of recent conditions in Northern California. At least 70 fires are burning across the state, the largest of which has scorched more than 42,000 acres of Deepwater National Park. Firefighters have scrambled to contain them under scorching hot skies. Temperatures are up to 6 degrees Celsius (10.8 degrees Fahrenheit) above normal for this time of year, and Queensland was home to all of the top 10 hottest weather stations in the country on Sunday, according to Bureau of Meteorology records. Gusty winds are also fanning the flames, creating an extremely dangerous situation. 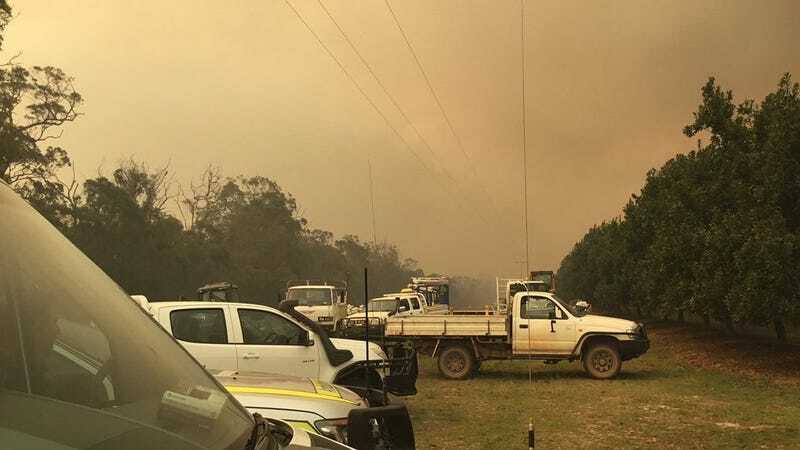 Queensland Rural Fire Service has told hundreds to evacuate their homes. “The central Queensland fire situation is unprecedented for its ferocity, the low humidity, the extreme heat and variable winds,” Annastacia Palaszczuk, the state’s premier tweeted on Sunday. In an effort to get the upper hand on fires, the state has called in help from neighboring New South Wales. Up to 100 firefighters have been dispatched along with a New South Wales Rural Fire Service air tanker that can drop nearly 4,000 gallons of water at a time. This is the first time one has been deployed in Queensland to fight fires, underscoring how dramatic the fires are. The rash of bush fires is bad news, but if you can believe it, this is actually a pretty good scenario compared to how things looked a few months ago. Then, forecasters were calling for an “insane fire season” after hundreds of blazes sparked up at the end of austral winter. The blazes have struck up amid the start to the wet season, but many are burning in areas where drought conditions are among the worst on record over the past six months, according to data from the Australia Bureau of Meteorology. Much of the state has seen roughly half of its average rainfall for the year-to-date with the exception of North Queensland. Conditions aren’t much better to the south in New South Wales. El Niño tends to favor drier than normal conditions in the parts of Australia currently ablaze, and the one that’s been ramping up in the Pacific for the past few months may be playing a role. Climate change has also increased the likelihood of fire weather in Australia as it has in the western U.S. That ups the odds for more destructive conflagrations and could spread already thin resources even thinner.